A picture paints a thousand words, and that’s no truer than when it comes to insight into the worst moments of human misery. You’ll know many of these events—we’ve even covered some of them here before. This list isn’t about the events but about the power of photographs. These images bring you closer to the horror than any description could. The Second Sino-Japanese War began in July 1937 and eventually became part of the Pacific theater of World War II. Not long after the war, with Japan advancing into China, retreating Chinese troops left a blockade across Shanghai’s Whampoo River. Japan announced they were going to bomb it on August 28, 1937, and news teams gathered to capture the event. The planes arrived at 4:00 PM. Most of the reporters had left after hearing that the raid was postponed, so only one cameraman was waiting. The bombers didn’t hit the Chinese defenses. They hit the city’s train station—which housed 1,800 civilians waiting for evacuation, mostly women and children. The Japanese aircrews had mistaken them for troops. In total, 1,500 died. The photographer, H.S. Wong, saw a man rescuing children from the tracks. The man placed the first young child on the platform edge before returning to help another—and that is the picture Wong took. The injured, helpless child sitting among such devastation went on to be seen by over 130 million people around the world within a month and a half. It was key in turning international opinion against the Japanese, and Wong had to be evacuated to Hong Kong under British protection when the Japanese put a price on his head. The 16-year-old boy in the above photos is Hans-Georg Henke. He was a member of the Hitler Youth, and the set was taken on May 1, 1945, the day before Germany’s surrender. The utter desperation and real tears would be moving enough from anyone. Yet it’s the boyish face and the body clearly too small for a soldier’s uniform that made the picture iconic. Henke’s story became exaggerated throughout the years as the photograph of the tear rolling down his cheek became famous. Henke himself, years later, claimed he’d been wearing only rags on his feet, though one of the pictures shows him in boots. Given the destruction around him, his memory lapse can probably be forgiven. 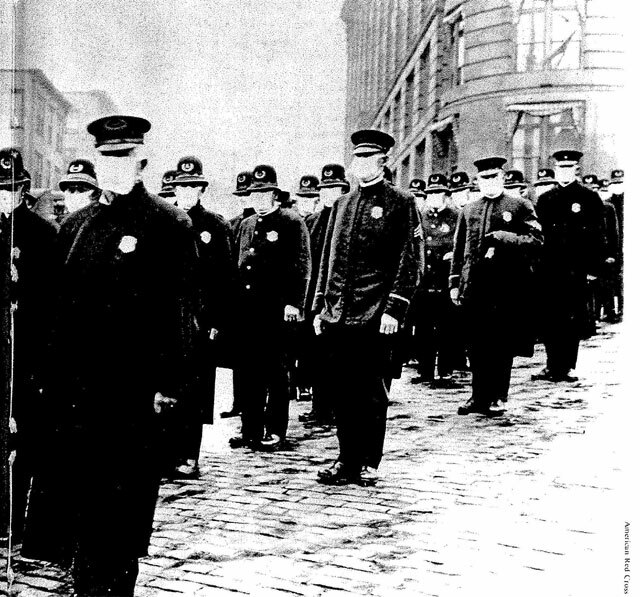 The influenza pandemic of 1918 killed up to 100 million people around the world. That was around the entire population of the US and six times the number killed by World War I. A few different types of picture that could impart how the pandemic affected people. There are photos of mass graves dug in Philadelphia to handle the bodies. There are hospital wards with so many beds that they look more like warehouses. And there are the outdoor hospitals set up when the indoors ones were full, rows of white tents separating patients from one another. The image above is less obviously horrifying. It shows people playing baseball while wearing masks. The crowd wear masks as well. And that reflects the most terrifying and devastating aspect of the 1918 pandemic in a way the other pictures don’t: It killed anyone. Young, healthy adults—of the sort that play baseball—normally rarely care about the flu, but the 1918 outbreak was different. It killed anyone, and we still don’t really know why. The photo also represents a sad futility when you learn that the masks didn’t protect people. While cotton gauze may stop bacteria, viruses are much smaller. Yet pictures record large groups wearing them, from police in Seattle, to paperboys in Canada, to soldiers in France, right down to the general public. Not one of them was protected in any way from one of the deadliest events in human history. Brazil was the final country to ban the import of slaves, and that was in 1853, when photography was still in its infancy. As a result, we have hardly any photos of the Atlantic slave trade. That’s part of what makes the above image—recently captured children, some malnourished and all miserable—particularly poignant. Yet this photo actually has a relatively happy story. It was taken aboard the British naval vessel HMS Daphne on November 1, 1868, and the children in the picture had just been rescued. Over the next three days, the British ship intercepted Arab dhows, rescued over 200 slaves, and transported them back to Africa. Daphne rescued 2,000 captives during its service. On August 13, 1961, Germany erected a barbed wire fence to divide Berlin in two. We’ve already covered some of the most depressing stories from what became the Berlin Wall. The photograph above is more bittersweet. The soldier is a guard from the East, under strict orders not to allow anyone across the new border. The child is a young boy separated from his parents and desperate to cross into the West. By reaching over to lift the boy to where he wants to be, the soldier is taking a risk—and the way he looks over his shoulder makes it clear he knows he shouldn’t be doing it. But the soldier lifts the boy across anyway. After the photo was taken, the child got free, but the soldier was seen and removed from duty right after. No one has been able to find out what happened to him. While we can hope his punishment wasn’t too severe, we can’t be certain. The East German army was later happy to watch children die near the wall rather than help. Imperialists in the 19th century painted foreigners as savages to gain support at home for their cause. British photographer William Saunders went to China in 1850 and staged the above image, ostensibly of a beheading in progress—cameras at the time needed such long exposure times that subjects had to dutifully pose. Newspapers printed the photo, strengthening the will of Western nations to “civilize” China. Saunder also photographed other practices that disgusted Europeans and Americans. Many of his pictures featured punishment using cangues—a heavy square board placed around a prisoner’s neck. Others featured foot binding, the art of breaking young girls’ feet and constraining them so they wouldn’t grow. As objectionable as both practices are, the military takeover of China was an unfortunate response. The Ukranian Holodomor was one of the worst famines in history. The manmade event is widely recognized as a genocide of millions and is comparable in scale to the Holocaust. The photograph above was taken in Kharkiv in 1933. While any photograph containing two corpses is disturbing by default, it’s the living subjects that make this picture powerful. The photo’s original caption reads: Passers-by no longer pay attention to the corpses of starved peasants on a street in Kharkiv. Imagine your reaction if you walked out of your house right now and saw a corpse on the street—then imagine what horror would need to surround you to change that reaction to utter indifference. The above picture was published in National Geographic in 1913, part of an otherwise beautiful series by Stefan Passe from his travels to the newly independent Mongolia. The caption is simple: A Mongolian woman condemned to die of starvation. Yet, it’s not entirely clear that starvation was the woman’s fate. Westerners had previously written of people placed in cages in Mongolian markets, where passersby could taunt and insult them as they starved. However, later reports described the cramped padlocked boxes as cells rather than methods of execution. Other reports claimed people would be locked in the boxes, unable to properly lie or sit, sometimes for years. Some of the boxes were placed in public, where people could pass the prisoner food through the small hole. Those punished for minor crimes would stay inside for one or two weeks. Given the bowls on the ground around the woman, Passe and National Geographic may have been pessimistic with their assessment of the woman’s fate. The photograph above was taken by US Marines photographer Joe O’Donnell shortly after the bombing of Nagasaki. He saw and smelled things beyond imagining, and the experience left him with depression in his later years. Yet according to O’Donnell’s son, the image above affected him more than any other. The younger child in the picture is dead. The older boy is his brother, and he’d carried his sibling on his back to a crematory. The older boy stayed and watched his brother burn yet refused to cry. He bit his lip so hard it bled. The boy had just lost everything to the most destructive force known to mankind. Yet, barefoot, he’d carried his sibling’s body to ensure he was honored properly. It’s a story of the extremes of sadness and bravery—and the photograph captures both. Before the Bergen-Belsen concentration camp was liberated in April 1945, the Nazis killed 50,000 people there. Anne Frank was among its victims—she was murdered just a month before the British arrived. The photograph of “Mass Grave 3” was taken shortly after. The man standing casually among the uncountable bodies is camp doctor Fritz Klein, who was hanged for his role in December 1945. The Allies needed pictures to convey the Holocaust’s scale to the many civilians that believed it had been exaggerated. Having the German in frame helped head off allegations of fakery. Alan should probably take a break from writing the sorts of lists that make him cry. It was the Nagasaki story that pushed him over the edge.